In February 2004, the Food and Drug Administration approved pemetrexed for treatment of malignant pleural mesothelioma, a type of tumor of the mesothelium, the thin layer of tissue that covers many of the internal organs, in combination with cisplatin for patients whose disease is either unresectable or who are not otherwise candidates for curative surgery. In September 2008, the FDA granted approval as a first-line treatment, in combination with cisplatin, against locally advanced and metastatic non-small cell lung cancer (NSCLC) in patients with non-squamous histology. A Phase III study showed benefits of maintenance use of pemetrexed for non-squamous NSCLC. Activity has been shown in malignant peritoneal mesothelioma. Trials are currently testing it against esophageal and other cancers. Pemetrexed is also recommended in combination with carboplatin for the first-line treatment of advanced non-small cell lung cancer. However, the relative efficacy or toxicity of pemetrexed-cisplatin versus pemetrexed-carboplatin has not been established beyond what is generally thought about cisplatin or carboplatin doublet drug therapy. Patients should take folic acid and vitamin B12 supplement even if levels are normal when they are on pemetrexed therapy. (In clinical trials for mesothelioma, folic acid and B12 supplementation reduced the frequency of adverse events.) It is also recommended for patients to be on a steroid (e.g., dexamethasone 4 mg twice daily) on the day prior, day of, and day after Pemetrexed infusion to avoid skin rashes. Low blood cell counts, as measured by a complete blood count. This is a dose-limiting toxicity. Mental fatigue and sleepiness. Fatigue can be reduced through an off-label prescription of Provigil. Nausea and vomiting. Pemetrexed's emetogenic effects are managed with prophylactic antiemetics. Oral mucositis (mouth, throat, or lip sores). Oral ulcers can be mitigated by proper oral hygiene, including rinsing of the mouth with salt water following consumption of food or drink. Skin rash. Physician-prescribed steroids administered on the day prior, day of, and day after infusion typically avoid skin rashes. Pemetrexed is chemically similar to folic acid and is in the class of chemotherapy drugs called folate antimetabolites. 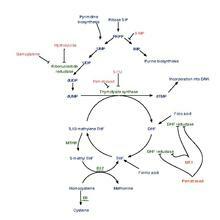 It works by inhibiting three enzymes used in purine and pyrimidine synthesis—thymidylate synthase (TS), dihydrofolate reductase (DHFR), and glycinamide ribonucleotide formyltransferase (GARFT). By inhibiting the formation of precursor purine and pyrimidine nucleotides, pemetrexed prevents the formation of DNA and RNA, which are required for the growth and survival of both normal cells and cancer cells. The molecular structure of pemetrexed was developed by Edward C. Taylor at Princeton University and clinically developed by Indianapolis-based drug maker, Eli Lilly and Company in 2004. It has been researched in the PARAMOUNT trial. In addition to the brand name Alimta, this drug is also marketed in India by Abbott Healthcare as Pleumet and by Cadila Healthcare as Pemecad. In the United States as of 2015 each vial of medicine costs between US$2,623 and US$3,100. ^ Manegold C (August 2003). "Pemetrexed (Alimta, MTA, multitargeted antifolate, LY231514) for malignant pleural mesothelioma". Semin. Oncol. 30 (4 Suppl 10): 32–6. doi:10.1016/S0093-7754(03)00283-5. PMID 12917819. ^ Cohen MH, Justice R, Pazdur R (September 2009). "Approval summary: pemetrexed in the initial treatment of advanced/metastatic non-small cell lung cancer". Oncologist. 14 (9): 930–5. doi:10.1634/theoncologist.2009-0092. PMID 19737998. ^ Rossi A, Ricciardi S, Maione P, de Marinis F, Gridelli C (November 2009). "Pemetrexed in the treatment of advanced non-squamous lung cancer". Lung Cancer. 66 (2): 141–9. doi:10.1016/j.lungcan.2009.06.006. PMID 19577816. ^ "Healthcare Professional Website". ALIMTA.com. Eli Lilly and Company. Archived from the original on 7 January 2009. Retrieved 1 December 2008. ^ "Maintenance pemetrexed (Pem) plus best supportive care (BSC) versus placebo (Plac) plus BSC: A randomized phase III study in advanced non-small cell lung cancer (NSCLC)". American Society of Clinical Oncology. Retrieved 22 July 2009. ^ Carteni G, Manegold C, Garcia GM, et al. (May 2009). "Malignant peritoneal mesothelioma-Results from the International Expanded Access Program using pemetrexed alone or in combination with a platinum agent". Lung Cancer. 64 (2): 211–8. doi:10.1016/j.lungcan.2008.08.013. PMID 19042053. ^ Azzoli CG, Kris MG, Pfister DG (June 2007). "Cisplatin versus carboplatin for patients with metastatic non-small-cell lung cancer—an old rivalry renewed". J. Natl. Cancer Inst. 99 (11): 828–9. doi:10.1093/jnci/djk222. PMID 17551137. ^ Hazarika M, White RM, Johnson JR, Pazdur R (2004). "FDA drug approval summaries: pemetrexed (Alimta)". Oncologist. 9 (5): 482–8. doi:10.1634/theoncologist.9-5-482. PMID 15477632. ^ "Alimta Patient Packet Insert" (PDF). ALIMTA.com. Eli Lilly and Company. 26 September 2008. Retrieved 1 December 2008. ^ "Alimta Prescribing Information" (PDF). ALIMTA.com. Eli Lilly and Company. 26 September 2008. Retrieved 1 December 2008. ^ "Important Safety Information". ALIMTA.com. Eli Lilly and Company. 26 September 2008. Archived from the original on 20 October 2008. Retrieved 1 December 2008. ^ "Oral Complications of Chemotherapy and Head/Neck Radiation". Cancer Topics – Coping with Cancer. National Cancer Institute. Retrieved 1 December 2008. ^ McLeod HL, Cassidy J, Powrie RH, Priest DG, Zorbas MA, Synold TW, Shibata S, Spicer D, Bissett D, Pithavala YK, Collier MA, Paradiso LJ, Roberts JD (July 2000). "Pharmacokinetic and Pharmacodynamic Evaluation of the Glycinamide Ribonucleotide Formyltransferase Inhibitor AG2034". Clinical Cancer Research; Clinical Trials. 6 (7): 2677–84. PMID 10914709. ^ Avendano, Carmen; Menendez, J. Carlos (April 2008). Medicinal Chemistry of Anticancer Drugs. Amsterdam: Elsevier. p. 37. ISBN 0-444-52824-5. ^ Langreth, Robert (29 June 2016). "Decoding Big Pharma's Secret Drug Pricing Practices". Bloomberg. Retrieved 15 July 2016. This page was last edited on 27 March 2019, at 11:55 (UTC).